While pork-scallion pot stickers are always going to be my favorite type of dumpling, from time to time, I like to change up the filling. These chicken-lemongrass dumplings are perfect for this time of year, the Chinese five spice powder — a combination of star anise, fennel, black pepper, cinnamon and cloves — laces the dumplings with a delicate warm flavor, a subtle twist on the usual fall spice palate. Prefer a more classic pot sticker shape to the flower bud? Check out the folding instructions here. If you are rolling the dumpling wrappers out by hand, I do recommend the classic pot sticker shape over the flower bud — the thicker wrapper is better suited to the former shape. Any stacks of leftover wrappers — you’ll definitely have some if you roll ’em out super thin — can be tightly wrapped and refrigerated for up to a week. Leftovers will be a bit more challenging to seal when forming dumplings, but are totally workable. Bonus: they can be sliced and fried up into a takeout classic, wontons! In a medium bowl, stir together minced garlic through five spice powder. 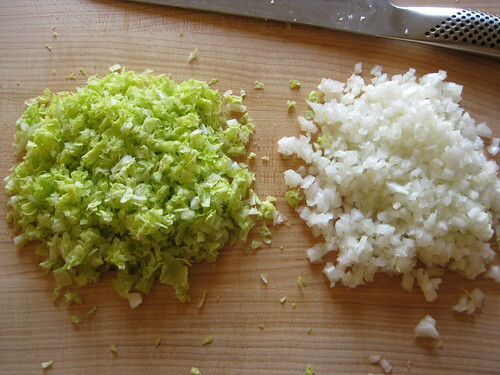 Stir in cabbage and scallions, coating evenly with soy sauce mixture (like you’re making a cole slaw). Add chicken, and use a fork to mix together just until combined. Cover tightly with plastic wrap and refrigerate while making the wrappers. DO AHEAD: Filling can be made up to two days before making wrappers and assembling dumplings. When you’re ready to fill the dumplings, make the wrappers. Whisk together millet flour through xanthan gum in the bowl of a stand mixer; fit mixer with the paddle attachment. Set machine on low and pour in boiling water. Mix on medium speed for 2 minutes. Scrape dough onto a clean, millet-floured counter (from now on when I say flour I mean millet, ok?). (The dough should be cooled enough to be handled after mixing, but if you find it too warm, let it sit, covered by a moist towel for several minutes.) Knead dough to combine into one lump (it will not be very smooth looking at this point). Work with about 1/6 of the dough at a time, cover the rest with a moist towel. On a floured surface (use as little as possible to prevent sticking), roll dough out til it’s about 3″ wide and 1/8″ inch thick, length will vary (if you’re rolling out by hand, keep rolling until dough is about 4″ wide and 1/16″ thick (or even thinner if possible), and go ahead and skip the next paragraph). Using the pasta roller on the widest setting (#1), sprinkle dough liberally with flour, run dough through (it may tear a bunch, but that’s ok, it’s gonna go through the machine a few more times). Fold dough over in thirds (so it’s still only about 3″ wide), use the pin to roll it out to 1/8″ again, sprinkle with more flour and run through the pasta machine on the widest setting again. Adjust width-setting of the machine to the next thinness (#2). Dust with additional flour (if it feels sticky), and run dough through, it will be about 1/16″ thick. You can stop here for a thicker-yet-acceptable wrapper, or — recommended — repeat running the dough through the machine two more times, adjusting the width-setting to the next thinness (#3 then #4) each time. Cut wrappers using a 3 1/2″ round cookie cutter; stack on a large piece of plastic wrap, fold it over the top to keep them from drying out while the other wrappers are made. (I usually stack about half of the wrappers together, then start a second pack — no leaning towers of dumpling wrappers for me!) Re-roll scraps (if you have enough) or knead them into another quarter of the dough; repeat rolling and cutting process. Line a freezer-safe platter or rimmed baking sheet with plastic wrap; set aside. Set out about 6 wrappers, moisten just the edges using your finger with a tiny bit of water. Place a slightly heaping TEASPOON filling in the center of the wrapper. To make the flower bud shape, basically pretend that you’re making a five-point star shape out of the wrapper. Pinch five equally-spaced pleats around the edge of the circle, pinch the pleats over the filling, toward the center, forming a a star-shaped dumpling with a small opening in the middle. Starting with the top pleat and working clockwise, fold pleats over, forming a flower shape (if needed, use a small amount of water to seal folds). Repeat with remaining filling and wrappers. Once all dumplings are formed, proceed to cooking or place pan in the freezer. Completely freeze dumplings on pan before transferring to a freezer bag or freezer storage containers. Will keep frozen for 2 – 3 months, cook directly from frozen. Fill a large pot fitted with a metal steamer basket with water (just under the bottom of the basket). Set pot over high heat and bring to a boil. Once boiling, carefully place dumplings in a single layer on the basket (they can touch a little, you’ll have to cook them in multiple batches). Cover top of the pot with a clean towel, place lid over top (towel has a dual purpose: keeps the dumplings from getting too wet, prevents the lid from rattling annoyingly). Steam fresh dumplings for about 8 minutes and frozen for 10 minutes, or until chicken reaches at least 165°F. While dumplings steam, preheat sauté pan/frying pan/skillet over medium heat; add about 1 tablespoon (just enough to form a thin film) of oil to the pan. Once dumplings have finished steaming, remove from steamer basket (you may need to gently wiggle them to get them off) and fry bottoms in the hot oil, just until golden brown (if using a non-nonstick pan, they will detach with a gentle wiggle once cooked, all is not lost!). Serve immediately with desired dipping sauces. ¹ Not sure how to work with lemongrass? Check out this video from The New York Times. Basically, you need to trim the top skinny part and a tiny bit of the root end (discard both). Then, slice the stalks in half lengthwise. Peel away and discard the tough outer layers, leaving the more tender fragrant interior. Next, we want to bruise the stalk which serves a dual purpose: (1) gets the flavorful oils to the surface and (2) makes mincing a breeze! I use the base of my chef’s knife handle to bruise (smash) the stalks, but that’s a bit dangerous in the event that the knife slips — I’d recommend going with the video’s suggestion of using a rolling pin or meat pounder instead. The stalks will be broken apart into long threads after bruising, so just gather them up and cut against the “grain” to mince. ² I enjoy one by Wok Mei, available at Whole Foods or online. Whisk together soy sauce through sesame oil in a small bowl. 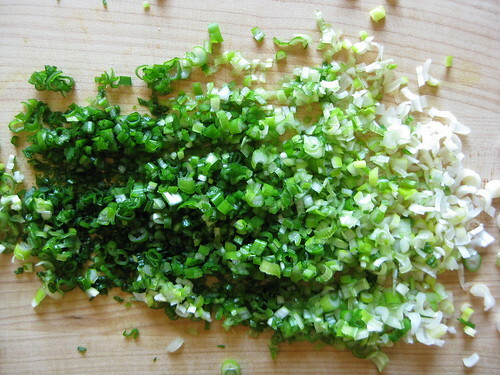 Stir in scallions. Serve immediately or cover and store in the fridge for up to 1 week. I’m so glad to find someone who makes their own wrappers! 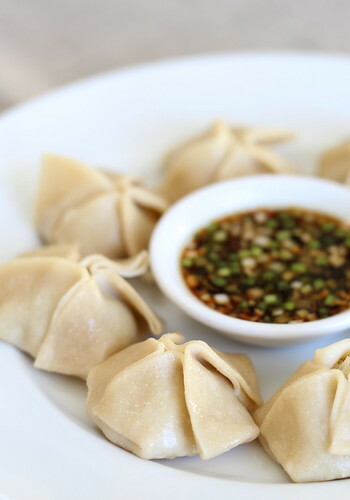 I also love this recipe and will be trying it next time I make a batch of dumplings! Can’t wait to try this – I’ve been craving dumplings for quite some time now!